A couple of days ago I found myself 75 cents short of $2.50 for the bus. I was returning home from shooting in my Robson Street studio. I got on the Granville trolley and put in $1.75 which is the rate for those 65 or over. I was 65 last August but a birth certificate mess up in Argentina has me officially almost a year younger. The driver did not even look at me and I picked up my transfer. It all had to do with wanting more candy corn. I was 6 or 7 and my mother had a big bag of candy corn that she had obtained from a friend from the American Embassy in Buenos Aires. She would hand me a few that I would greedily eat in one blow. I noticed that she put the bag away in a drawer of her armoire in her bedroom of our house in Coghlan. One day when my mother was not around I went into the bedroom and opened the armoire and helped myself to the whole bag. The armoire had a mirror and I suddenly noticed myself in it. I stopped to look at myself and I think that for the first time I realized that I was an individual. I remember thinking , "Soy yo." (I'm me.) When my mother found out I received a sound spanking. Now the time elapsed between seeing myself in that mirror with candy corn in my mouth and the arrival yesterday of my gold Care Card seems to be as fast as the flutter of a butterly wing and as compressed as a butterfly's existence. Can that be possible? 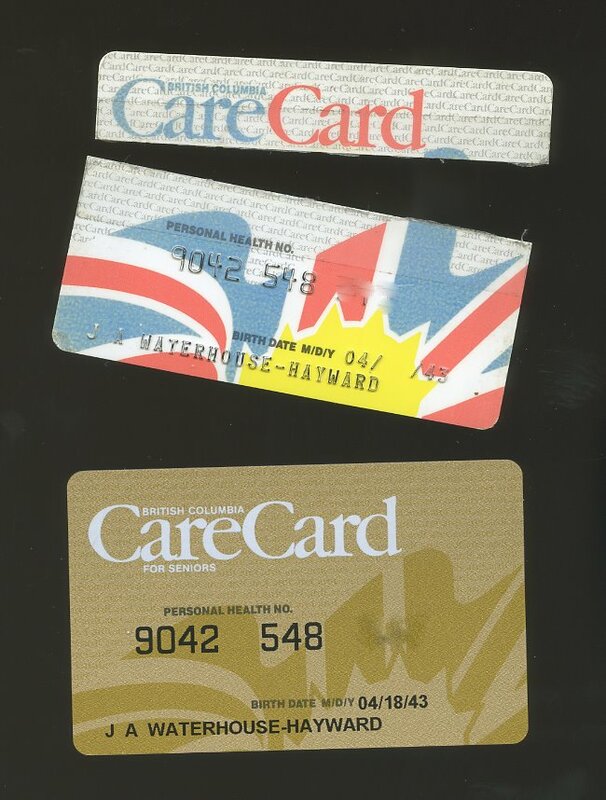 When we arrived in Vancouver within months I had lost my Social Insurance card. I have never bothered to get another one. The few times anybody has requested my SIN, I always ask them to wait. I tell that I have to find one of my cameras. In the late 70s many of us in Burnaby engraved our SIN number on our valuables. I engraved it on to my cameras. 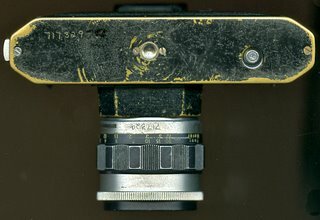 Here you can see the number (three digits have been Photoshopped out) on the bottom of my Pentax S3 as well as on the Takumar 55mm F-2 lens. For years I have used a torn Care Card that I repaired with transparent tape. It seemed like these cards weren't all that useful and could not even be used as an ID as they had no picture on them. The impact of that Gold Card yesterday was very much like the one of the candy corn and the mirror. For a while I have equated my life with that of a slipping clutch. The Gold Card has made it that much more obvious. But there is one difference and that is the whole image of the senior that retires to golf or who might winter in Florida. Or the repellant image that I used to have of taking pictures of Canadian Pacific Limited executives who were given retirement roasts at the Terminal City Club. The roasts used to depress me to no end and only the frown in Rosemary's face (a frown that said, "We need the money. You need to take those pictures.") made me stick to the job. Powerful executives on one day were given on the next rocking chairs, gold watches, fishing rods and golf clubs. They were told to have a long and happy retirement. I never quite understood what that meant. To me the Gold Card means that I must perhaps be more careful about falling. As a freelancer I cannot afford to be out of action for long. The Gold Card means I will be able to go to my beloved Pacific Baroque Orchestra and Early Music Vancouver concerts and pay a bit less for the pleasure. But perhaps the most comforting aspect of my Gold Card is the sudden awareness that this is the last and only card I will ever need.